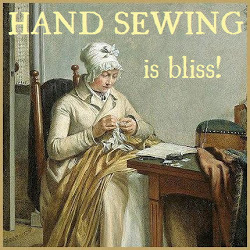 Last post relating to witzchouras, we looked at basic definitions of the word, determining that the garment and its name developed from Polish and French influences, that the garment was popular c. 1808 to 1835, and that the chief qualifications are that it is an outer coat or mantle lined and trimmed in fur. But let’s not stop there: here are more references to the witzchouras from the early 19th century. Throughout the 18th century, a franc was similar in value to a livre, and about 20 of either of these coins equalled one Louis d’Or. La Belle Assembleé tells us that a witzchoura in 1817 was worth 30-90 Louis d’Ors. What I’m driving at here is the relative value of one of these garments. The OED gives us an idea of the value of a livre over time: in 1746 one captain was paid 120 livres a month (6 Louis d’Ors). Extrapolate that for a year, and that captain was making 72 Louis d’Ors, just enough for a witzchoura or two and nothing else! Another example from 1797 sounds outraged that an English sea officer was charged 300 livres for eight days of lodging (15 Louis d’Ors). That’s almost 60 Louis d’Ors per month, which would easily be a witzchoura, though I doubt that sea officer would need a witzchoura instead of lodgings! The takeaway message is that, as La Belle Assembleé says, witzchouras were costly and worn only by the wealthy. It is worth noting that there are fur lined pelisses mentioned which do not qualify as witzchouras in the eyes of La Belle Assembleé. I’ll be examining these almost-witzchouras in a later post. As we established before, by the 1830s the shape of the witzchoura had changed to accommodate the changing fashions of dresses under them: becoming more cape-like, with collars and loose sleeves rather than being fitted like a pelisse as they were in the earlier years of their popularity. Again, we are reminded that witzchouras are made from expensive fur, and the more expensive the fur the more likely to see it displayed as much as possible. Here there is a mention of another garment similar to a witzchoura: in this case a burnous. According to the OED again, a burnous is a woman’s cloak or mantle from the 19th century resembling an Arabian upper garment of the same name. 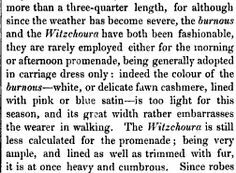 It is interesting to note that by the 1830s and 1840s a witzchoura is described as heavy, cumbrous, and very ample instead of the more fashionable and positive descriptions from the decades prior. This is the second mention in this post of a similar (or possibly the same) garment of Russian origin. In addition to the specific evidence of the Polish origins of the witzchoura in name and relating to Napoleon himself, I’ve also come across multiple mentions of the witzchoura style being brought back to France from Russia by Napoleon’s forces. Both of these influences fit in with the dating we’ve established and lead me to wonder if these are two separate and unique garments. 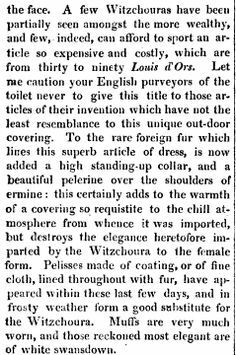 Perhaps, though I suspect that if they were indeed separate styles in name they would have been variations on a similar theme, just like the fur-lined pelisse mentioned earlier in this post. 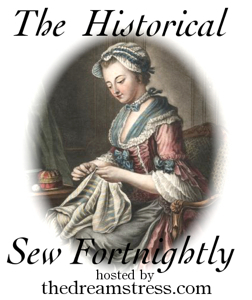 This entry was posted in 1810s, 1830s, 1840s, 19th Century, Contemporary Quotations, Costume History, Dictionary Definitions, Regency Clothing, Vernet Project 1814: Merveilleuses & Incroyables and tagged 1810s, 1830s, 1840s, 19th Century, Clothing, Historic Clothing, Regency, Vernet, Witzchoura, Women's Clothing. Bookmark the permalink. That is a very interesting price calculation. I have never looked at it that way before. But, even today, fur coats of any description are a great luxury. Witzchouras were definitely among the priciest coats of their time frame, too. Much looking forward to your next research post.